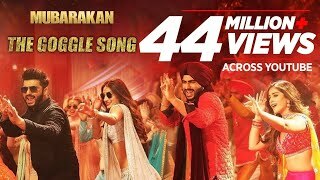 The Goggle Song Lyrics from Mubarakan starring Arjun Kapoor, Anil Kapoor, Ileana D’Cruz and Athiya Shetty. The song is sung by Sonu Nigam, Armaan Malik, Amaal Mallik, Tulsi Kumar & Neeti Mohan. The song has music produced by Amaal Mallik with lyrics penned by Kumaar.